ESTRUCTURAS ARQUÉ is a family-run company which has specialized in the construction of metal structures for over 50 years. We have carried out more than 6,000 projects in Spain and abroad. Current facilities are over 20,000 m2 in total surface spread out over three different work centres. This allows us to optimize project management and the production of metal structures, totalling 15,000 tonnes per year. Since its implementation, Estructuras Arqué has held the CE certificate in EXC4 – Execution Class 4 (maximum European certification) both in Structural Manufacturing and Structural Sizing awarded by Lloyd’s Register certification body, making it a pioneering company in the sector. We aim to meet the expectations of our clients by offering the highest performances in all our processes. Constantly seeking new solutions and technical challenges are part of our DNA. We make no distinction between small and large projects. For us every project is a challenge we approach with enthusiasm, wishing to adapt to the needs of individual clients. We have been providing our experience in the industry of reinforced metal since 1942. Although young, our team has received great recognition for its work in the sector. ESTRUCTURAS ARQUÉ has a multidisciplinary team of professional experts from every sector. Our staff are the company’s greatest asset. This group of highly qualified technical professionals are highly experienced in the sector of metal structures. Those in charge of each project supervise each and every phase, from development to engineering and the manufacturing and assembly process, always backed by a team of specialists. This method allows supervisors to control each stage with their total commitment to excellence. The optimum results obtained are an added value much appreciated by our clients. In 1942, in the difficult period of the post-war Fermín Arqué Greoles, a renowned blacksmith, set up a forge that was to cover all aspects of ironwork, producing tools and metal joinery, and even shoeing horses. Celdoni Arqué Vilajosana was keen to follow in his father’s footsteps and some years later he founded ESTRUCTURAS ARQUÉ, producing his first metal structure in the municipality of Olesa de Montserrat in 1960. In 1997, Celdoni Arqué retired, giving way to the new generation, with his sons, engineers Fermín and Salvador Arqué, taking over the management of the company. 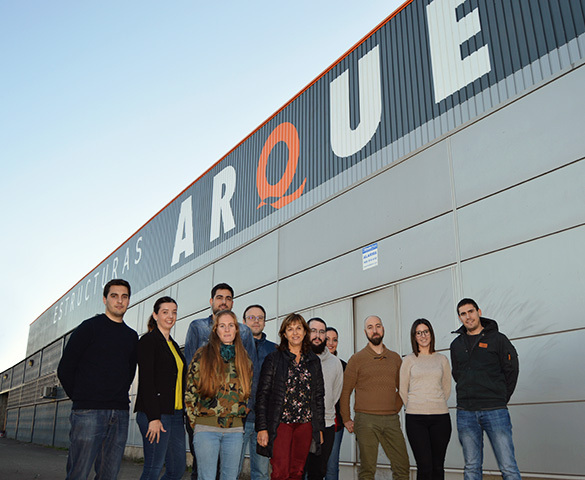 ESTRUCTURAS ARQUÉ was a founding member of ASCEM (Association for the Construction of Metal Structures), the only association in Spain concentrating on metal structures. Since its creation in 1999, Fermí Arqué has continually occupied different positions on the Board of Directors. In 2013 Estructuras Arqué purchased the CEMESA production unit in the province of Lérida. In 2015 a technical office was inaugurated in the municipality of Sant Cugat del Vallés.